Before I dive into the specifics surrounding each of the fantastic sightings that occurred here over the first thrice-monthly period of 2019, I’d like to first mention that after a four month break from writing this journal, I’m very happy (and very proud) to be back at it to kick off the new year! In addition to this journal, please note that the Noteworthy Observations Page is continuing to stay fully up-to-date to the best of my ability, and this year I’ve added a Noteworthy Observations Criteria page that should be beneficial to those wondering just how I go about selecting the records that get mentioned in these journal entries. Please check out both when you have the time. Also, the Comprehensive Checklist has been revised for 2019, so the taxonomy, color-coding, and eBird map/chart links are all up to date. The Arrival/Departure Tables have not yet been revised however, though they should be soon. Additionally, the Species section of this site is going to get a new look in 2019. Now, without further ado, please enjoy the first thrice-monthly journal entry for the year 2019! 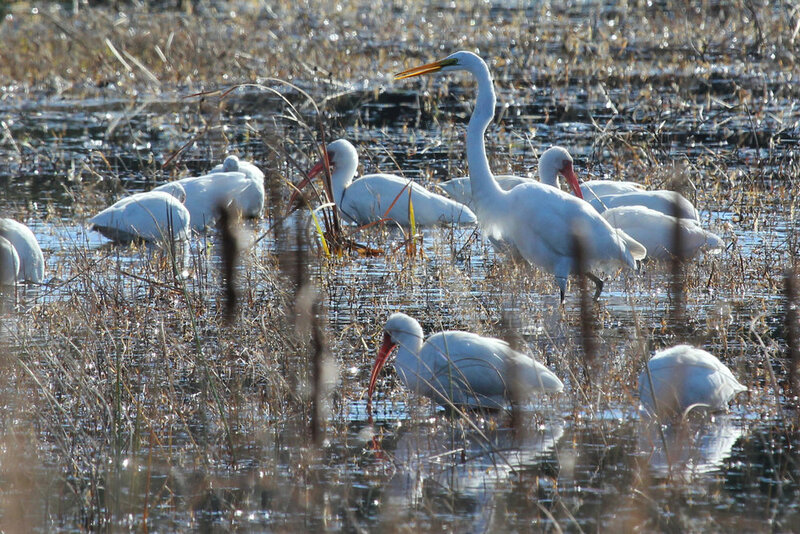 With the new year upon us, birders flocked to the coast to get off to a hot start on year lists, and Virginia Beach saw over 540 eBird checklists come in through the first ten days of 2019. Along the way, a great many rarities were documented throughout the city, some having lingered over from the late portion of 2018, and some being newly found. Leading the early January period was an incredible record for COMMON MURRE, as well as records for BREWER’S BLACKBIRDS beginning on the first of the year. Additional rarities that carried over at the same locations from late 2018 included: CACKLING GOOSE, ICELAND GULL, WESTERN GREBE, PARASITIC JAEGER, PURPLE FINCH, SNOW BUNTING, WESTERN TANAGER & PAINTED BUNTING. Unseasonal occurrences for BLUE-WINGED TEAL, RUBY-THROATED HUMMINGBIRD & BLACK-AND-WHITE WARBLER were also documented this period, and we also had a very late report for ROYAL TERN. 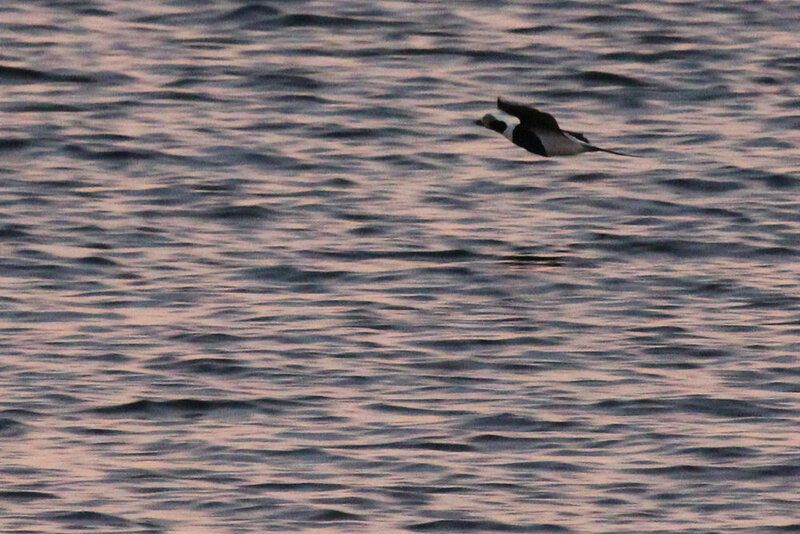 The true highlight was the city’s first record for COMMON MURRE (ph. Alexis Rabon) dating all the way back to 1995. Observed a couple of miles offshore of Cape Henry from aboard the Whales & Wildlife Sea Adventure boat operated by the VA Aquarium and Marine Science Center, this is also our first photographically documented record in eBird. More information regarding these boat trips can be found on their official website, by clicking Here. Recently, these boats have been spotting good numbers of Razorbills, scoters, gannets, and the other expected waterfowl/gull species, but it is very possible that more species of alcids (Thick-billed Murre, Dovekie, etc.) could be discovered with continued searching. As with the winters of 2016-17 and 2017-18, Breeze Farms, a private residence along West Gibbs Road is hosting a group of BREWER’S BLACKBIRDS. First detected for this winter on 1 Jan (vis. Andrew Baldelli), the group has been reported in counts ranging from 1 to 13 individuals. Please keep in mind that this property is not public, and while birders have likely viewed from within the public roadway right-of-way, caution should be taken to ensure proper respect is given to the property owners who have been kind enough to allow many birders over the past few winters to view these birds. Another word of caution here, there are plenty of Common Grackles, Brown-headed Cowbirds and Red-winged Blackbirds that frequent this location as well, and care needs to be undertaken to ensure proper identification. The females are the easiest to identify due to their marble brown eyes, which helps them stand out. The males, all glossy, are much smaller than Common Grackles, with shorter tails and daintier bills. 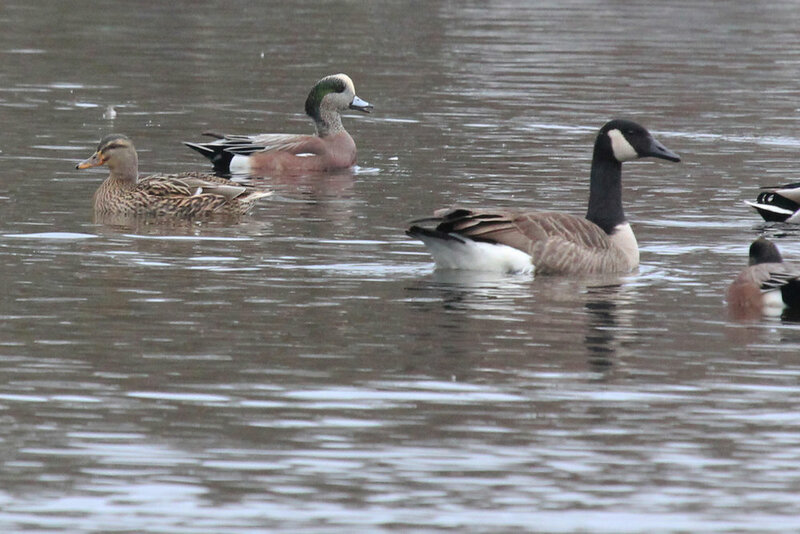 Up to two CACKLING GEESE were observed and photographed on Sherwood Lakes from 5 Nov-10 Dec and it appears that one has persisted with the large Canada Goose flock that travels between the lakes, the fields off Firefall Drive and the lake contained within Haviland Drive’s circle. A single report came in from Haviland this period, on 1 Jan (vis. Karen & Tom Beatty), and all three locations are worth scrutinizing if hoping to find this species. 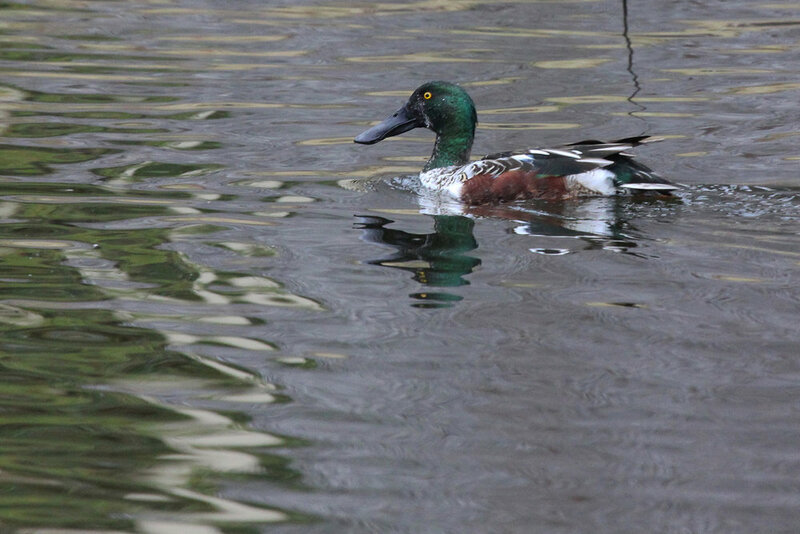 One bit of advice, the species is significantly easier to pick out when it’s on the water, as opposed to in the fields. On the water, all the geese sit at the same elevation, so it’s size and height are immediately noticeable as being different than the surrounding Canada Geese. In fields, the topography doesn’t always lie perfectly flat, and ditches and dips in terrain quickly obscure the true size of the geese as they forage. Sherwood Lakes is worth checking whenever time warrants, and while we’ve yet to have any records of Ross’s or Greater White-fronted Geese this winter, with an expected drop in temperatures likely to arrive soon, both are still quite possible. At least two ICELAND GULLS frequented our coastline throughout the early January period, with one immature (first cycle), and one gorgeous adult Kumlien’s-race individual. 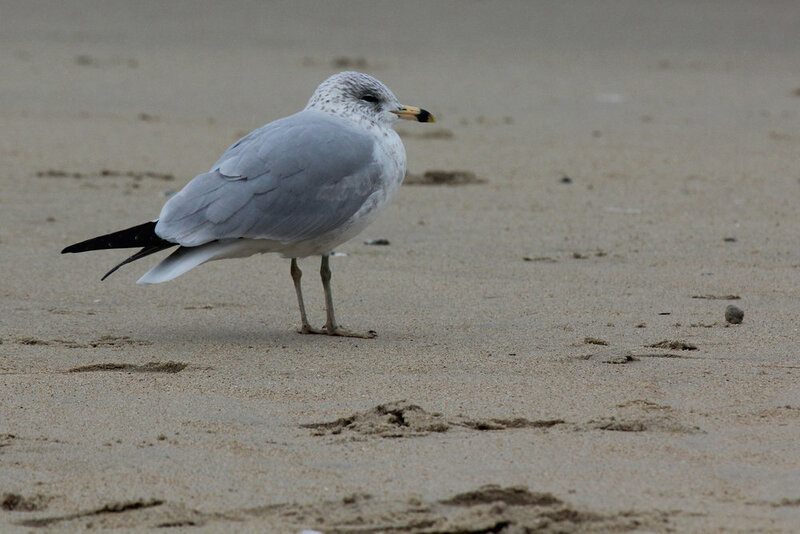 The adult was first observed on the beach at 39th Street back on 27 Dec 2018 (ph. Linda Chittum & Ada Jones), and was re-found at the same location during this period on 4 Jan (ph. Andrew Baldelli & Kathy Louthan). This is actually the exact location where an adult Kumlien’s was observed in the winter season of 2017-18, which begs the question as to whether this is the same exact individual returning for a second season, though there’s not really any way to tell for sure unfortunately. A first cycle immature Iceland Gull has also been reported at varying locations along our coast dating back to 26 Nov 2018 when one was first logged at Back Bay NWR (ph. Mike Collins). 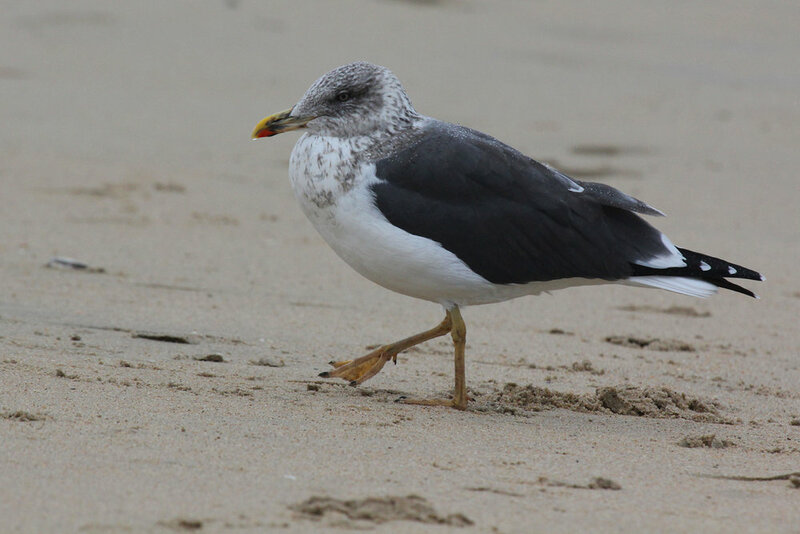 Given the ease with which these gulls can travel along our beaches from point to point, it is difficult to say whether this is the same individual that popped up in early January, but it is certainly not out of the question. To that point, a first cycle individual was observed at three separate locations during early January, with records at Back Bay NWR on 5 Jan (ph. Logan Anderson & Garrett Rhyne), at 88th Street Beach on 6 Jan (ph. Nathaniel Abrahams / Logan Anderson / Carson Lambert / Andrew Rapp / Garrett Rhyne / Sam Simon / Robert Wood), and lastly at Rudee Inlet on 7 Jan (ph. Andrew Baldelli). Anyone seeking out these Iceland Gulls would be best served stopping at multiple points along the oceanfront, and spot-checking for large congregations of gulls since typically they are mixed in with groups of Ring-billed Gulls. The Rudee Inlet dredge pipe that expels water and sediments onto the beach at 6th Street would be an ideal location to check, so long as the pipe is flowing with water. Likely the same WESTERN GREBE that has been sporadically detected along the coast at Back Bay NWR since 3 Dec 2018 (ph. Dianne Hinch & Maggee Smith, later ph. Charlie Bruggemann), and also detected from Little Island Park on the Back Bay CBC of 29 Dec 2018 (ph. Andrew Baldelli & Linda Chittum) was also observed at the latter location this period on 5 Jan (vis. Clark Olsen). As with the case of the adult Iceland Gull, it is possible, or even likely that this Western Grebe is the same one that wintered in the area last winter, and the winter before that as well. Regardless, we’ve now had records for Western Grebe in the city in 2016, 2017, 2018 and 2019, which seems remarkable given the species was still considered an extreme rarity in the east not too long ago. More expected during migration windows in late fall and spring, a single PARASISTIC JAEGER reported at Little Island Park on 5 Jan (vis. Logan Anderson & Garrett Rhyne) made for another exciting find. Typically, we don’t see much in the way of winter records for this species from shore, so any record is nice to see. So long as we have large flocks of gulls moving over water, the jaegers are likely to continue, as they depend on the gulls to scavenge food from, sometimes in incredible chases best viewed by scopes from the pier. In the fall of 2017, we had an incredible season when it came to jaegers, with counts of greater than 20 observed in early November of that year. However, this past fall we didn’t get the same luck, though individuals were still noted on days with the proper conditions at locations like Rudee Inlet and Little Island Park. Experiencing an irruption year, PURPLE FINCHES were observed at two locations in the city during early January. Two adult females were found at a private residence in South Shore Estates on 6 Jan (vis. James Marcum) after a male was present at this location back on 28 Nov 2018. Several other private residences have held the species at backyard feeders during Nov/Dec, but records in publicly accessible areas have been somewhat difficult to come by, even during what has been a banner season for the species throughout most of the state. One Purple Finch was heard at the Milldam Creek crossing of Crags Causeway in the Blackwater section of the city on 6 Jan (aud. Logan Anderson & Garrett Rhyne). Had it not been for the Ash-throated Flycatcher that was noted at this location during the Back Bay CBC on 29 Dec 2018 (ph. Karen & Keith Roberts), observers likely would not have known of the presence of these Purple Finches. Discovered initially the following day, 30 Dec 2018, a peak count of four were noted on 31 Dec 2018 (ph. Steve Myers) but so far in 2019 there has only been the one record. Please note that if you attempt to find Purple Finches along Crags Causeway, the land on either side of the road is private property, and marked clearly as such. There is a small pullover area north of the creek crossing which can fit a few parked cars, but otherwise observations need to made from the roadway shoulders. In contrast to last January where we didn’t have a single record, SNOW BUNTINGS were observed at two separate locations to kick off the new year. With records for 2-12 individuals occurring at Back Bay NWR from 25 Nov-2 Dec 2018 (ph. Stephen Keith & Alain Roberts) but with no records to close out the year, it came as a bit of a surprise when two individuals were found there on 1 Jan (ph. Robert Wood). A larger flock of up to 16 individuals was recorded along the dune/beach line between 82nd and 88th Street Beach from 12 Dec-31 Dec 2018 (ph. Stephen Keith), then missed by quite a few folks over the next few days. However, the flock, or at least twelve of them, were observed at 85th Street Beach on 7 Jan (vis. Lynn DiFerdinando), so it appears they’ve persisted in the area. Prime habitat in this area continues southward to about 58th Street, so they’re likely to move around considerably, and the fact that all records have been between 82nd and 88th is probably just because this is where birders are seeking them out. Point being, if they can’t be found there, walking farther south might end up yielding an observation outside the known area. If they still can’t be found, the dunes along the southern shore of the Chesapeake Bay at First Landing SP might be another good spot to check for this species, having been the more reliable spot over the last two winters. Last on the rarities currently frequenting the backyard of private residences, a single female WESTERN TANAGER continues to be observed almost daily in the Windsor Woods neighborhood of central Virginia Beach. First observed at this site back on 13 Dec 2018 (ph. Lisa Rose), the same individual was photographed most recently on 7 Jan (ph. Lisa Rose), and has been fairly reliably seen during the morning hours. At present, it is the only known wintering Western Tanager in the city, though in past winters at least one, or possibly several have been observed along the Shore Drive and Great Neck corridors. Anyone with a feeder should be checking for this species, which can sometimes blend in with the plethora of Baltimore Orioles that have been wintering in the city in recent years. You never know when one will show a different color, and different bill shape. Highly sought after to the point where birders frequently obscure the actual location of their presence (and for good reason), at least two private residences have been reporting PAINTED BUNTINGS this winter in the city. While the Kempsville residence recorded a female/immature from 7 Nov-15 Dec, there have not yet been any 2019 reports at this location. However, in central Virginia Beach, where one male (and very likely more) have been present since at least 2 Dec, a female was added on 7 Jan (vis. Andrew Baldelli). At the moment, there are no known locations where Painted Buntings are present on public property though, but any scrubby habitat that runs adjacent to properties with feeders might be worth checking out. Or who knows, by simply driving the backroads of southern Virginia Beach, you might have a gorgeous male fly over your car like the one found on Muddy Creek Road on the Back Bay CBC in 2017 (ph. Karen & Tom Beatty)! 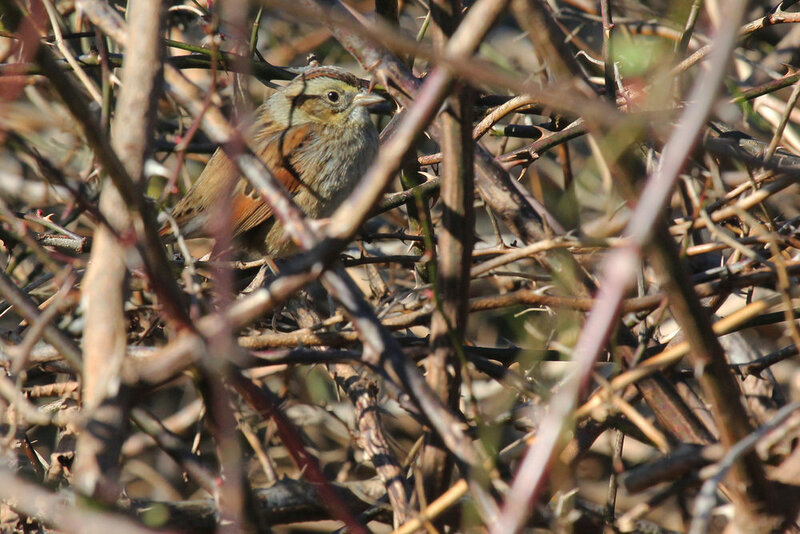 Along with the outright-rarities listed above, we also saw reports for several species that are expected during other seasons, but not in the winter in Virginia Beach. 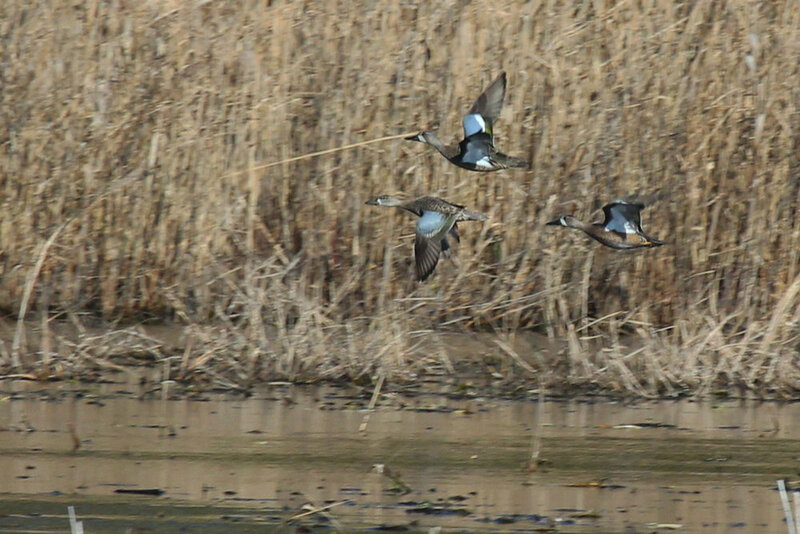 Leading off, a group of three BLUE-WINGED TEAL were found on the northern impoundment of Princess Anne WMA’s Beasley Tract (ph. Rob Bielawski). Atypical during the winter season at this location, Blue-winged Teal are a good find anywhere in Virginia as a whole this time of year. There are typically a few records though, but most hail from the closed-to-the-public impoundments of Back Bay NWR, with Mackay Island NWR to our south the “expected” northeastern limit of annual wintering for the species. Through the first ten days of the year, this is the only record for the state, in fact. Individuals should continue to be looked for in groups of dabbling ducks for as long as the weather stays unseasonably warm. Please note that Princess Anne WMA is only open on Sundays this time of year, being closed Mon-Sat for refuge management and hunting purposes. So far unique to Virginia Beach in the 2018-19 winter season, RUBY-THROATED HUMMINGBIRDS have been observed at two separate locations. Up to three individuals have been noted at Camp Pendleton SMR (Restricted Access), with records continuing on 2 Jan (ph. Karen & Tom Beatty) and on 6 Jan (ph. Steve Myers). Another individual was observed at a private residence in Laurel Manor north of Hilltop on 6 Jan (vis. Tommy Maloney). With no reports for the species continuing anywhere else in the state after November, it’s quite exciting that perhaps four individuals are known to be present in Virginia Beach this winter. It would behoove anyone in the city to closely monitor their feeders if still up & running, as several other vagrant hummingbirds (Rufous, Allen’s, Black-chinned, Calliope) are possible, though certainly not expected by any means. Any warbler species outside of our five expected winterers (Pine, Palm, Yellow-rumped, Orange-crowned & Common Yellowthroat) garner mention during January, and this first period got off to a hot start with two additional species being observed (though Common Yellowthroat managed to get missed actually). Very unusual in winter anywhere in Virginia, a gorgeous YELLOW-THROATED WARBLER has been reported from a private residence since 28 Dec 2018 (ph. Reuben Rohn), with the most recent record occurring on 10 Jan (ph. Reuben Rohn). 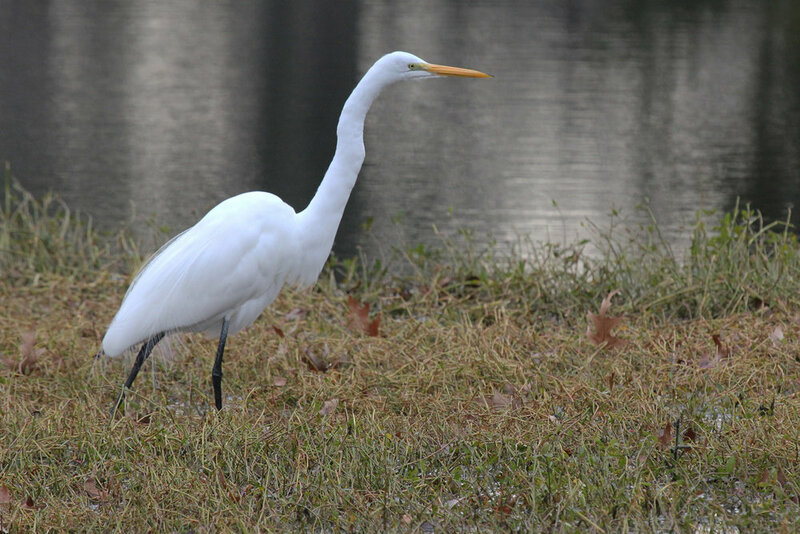 Last winter, there was a pair of locations that yielded winter records for this species in the city, one in Pembroke Manor, and the other in Kempsville. It’s curious to speculate as to whether the same individual has overwintered again, and is moving around (since the Pembroke Manor residence did have one again this December). Time will tell, but it’s worth checking your feeders if you live in the Kempsville portion of the city! Lastly for the unseasonal occurrences, a single BLACK-AND-WHITE WARBLER was discovered at Pleasure House Point NA along Dinwiddie Drive on 6 Jan (ph. Nathaniel Abrahams / Logan Anderson / Carson Lambert / Andrew Rapp / Garrett Rhyne / Sam Simon / Robert Wood). To close out 2018, there was also a pair of records for this species in late December, with one occurring in Kings Grant during the Little Creek CBC on 31 Dec (vis. Nicholas Flanders) and another individual found along Crags Causeway during a twitch of the report Ash-throated Flycatcher on 31 Dec (ph. Steve Myers, vis. Tommy Maloney). Black-and-white Warbler tends to be the most expected of the non-winter warblers to winter here. If birding was basketball, it would essentially win the Sixth-man Award. After Black-and-white, other likely lingerers are Prairie and Nashville Warbler, with the former having generated a pair of records in December, but with neither species represented thus far in January. As with all birds, all it takes is some hard work, and some luck, and maybe we’ll pick up another warbler species in mid-January. Usually departed by year’s end, a pair of well-described ROYAL TERNS were recorded from the Little Island Pier on 1 Jan (vis. Josh Lefever & Mark Mizak), making for a first record in almost a month (last one was a single individual at Back Bay NWR on 6 Dec 2018), and what is almost certain to be the final record of this species until their spring arrival occurs in mid-March. Given the warm weather this winter so far, it seems a bit miraculous that no other records were noted in mid-or-late December, and neither CBC in Virginia Beach (Back Bay, Little Creek) appears to have recorded the species this year. In most years, individuals linger around Fort Story through year’s end, and perhaps these two did just that, before heading south along the coast. Maybe? In addition to all the noteworthy finds listed above, a great number of interesting, but expected, species were observed in the city this period. In fact, 150 total species were logged to eBird in Virginia Beach during early January, which is quite a feat, and puts the city at the top of the list in terms of counties/cities in Virginia as a whole for 2019 thus far. Accomack logged 132, Northampton logged 124, and then Fairfax was the top of the non-coastal counties at 106, which paints the clear picture of where the most diversity can be found in winter in Virginia (…the coast). A group of BRANT continues to be observed in the agricultural fields between Ocean Lakes HS and the HRSD wastewater treatment plant off Firefall Drive, with a peak count of 66 observed there this period. RAZORBILLS continue to observed in typical numbers along the coast, though we don’t appear to be anywhere near the level of early 2017 which saw hundreds/thousands of them present off of our coastline. 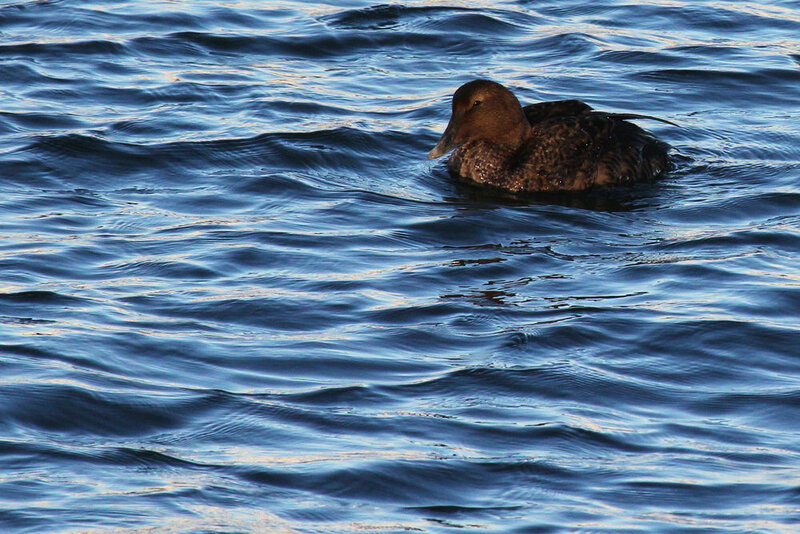 COMMON EIDERS have been observed in several locations, but one adult female has persisted around the Little Island pier for quite a while, with other records occurring frequently at Rudee Inlet. 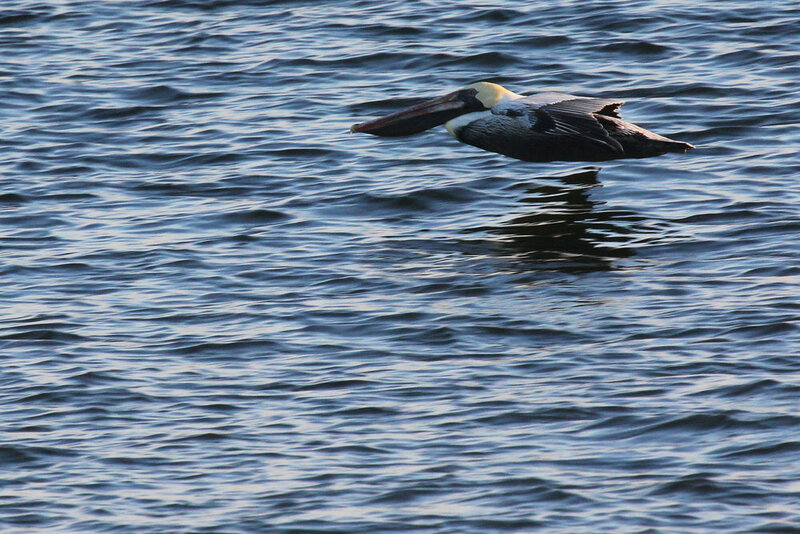 RED-NECKED GREBES have been spotted from both Little Island and the oceanfront as well, as have LONG-TAILED DUCKS which have become much more difficult to find in the city with the loss of access to the Chesapeake Bay Bridge-Tunnel’s first island to construction activities. This same issue has severely impacted our ability to find Great Cormorant, Purple Sandpiper and Ruddy Turnstones as well, with all three species being missed altogether in early January! Several reports of single WILLETS surfaced along the beaches, and this is typically a difficult species to find in Virginia Beach during the winter despite being common on the Eastern Shore and the Outer Banks as well. Similarly, we didn't log any Black-bellied Plovers this period, though they "should" be here but just don't tend to be found in January. A group of BLACK SKIMMERS has held their foothold at Lynnhaven Inlet, contrasting with 2018 where we didn't have a single record for them until early April! A reliable VIRGINIA RAIL continues to be quite vocal in the early morning hours at Little Island Park’s kayak launch. Some days, there is also SORA present in this area, with both species often being searched for by visitors from out of town given this is one of, if not the most reliable location in the state for both species in winter. Last year, we even had a pair of LEAST BITTERNS found at this location, but so far, no such luck in 2019! In terms of interesting passerines, BLUE-HEADED VIREOS were reported at Francis Land HP on 1 Jan and also at Stumpy Lake NA from 6-10 Jan. This species annually winters here in the city but is difficult to find anywhere else from Dec-Feb in the state.